So, I guess it’s fair to say Sophia Webster likes Coca Cola, right? 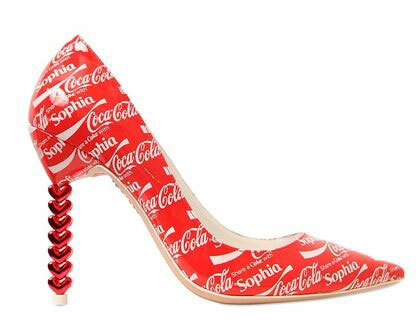 These Coca Cola shoes are currently available at Louisa Via Roma, and while, OK, the “share a Coke with Sophia” bit is a pretty cute idea, I’m interested to know how many people want to turn themselves into a walking advertisement for Sophia Webster / Coke when they wear them? Or to look like their shoes are made from recycled Coke cans: I can only imagine the constant comments I’d get if I ever decided to wear these, but then again, I WOULDN’T decide to wear them, so I guess I’m safe. The Coke print upper is the obvious talking point here, but the heel deserves a mention too. It’s made from a stack of little hearts, and although it’s not quite my thing (I like hearts on toes, but not on heels, apparently: actually, I don’t really like anything on heels – I always think a stiletto looks best when it’s left well alone, but that’s just me…), it could be pretty cute if it was paired with something other than the Coke Can upper. This is Sophia Webster, though, and one thing we’ve learned is to always expect the unexpected: she’s the queen of unusual shoes, and will never go for the obvious look. I actually love the brand for that exact reason – Sophia Webster shoes tend to divide opinion, but they’re never boring, and one thing shoes should never be is boring, right? Aside from the fact I don’t really care for the cola taste, I don’t want to advertise shameless plugs for any other business than the look of the heel’s brand. 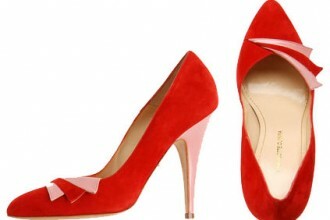 Even then, I don’t want the brand name splashed or appliqued on the uppers or the heels of the shoes. When I first read the email title, The thought of the famous coke bottle silhouette was my first impression of what the design would entail most likely as the heel, but that was completely ignored. Any way it makes no difference, because I don’t want to wear them, more than I don’t want to buy them. Thanks for sometimes showing some of the ridiculous intriguing attempts of some shoe brands. It has been a few years since a pizza business tried to sell a pair of $18.95 stiletto platform pumps over the internet for $200.00 because their logo was embedded on the uppers. Even though I kind of liked the pumps, the price was such a turn-off, especially when I can go to the nearest shoe retailer and get a similar pair (without the pizza advertising) with around a 90% discount of the pizza business’ inflated cost. Then I could go to my favorite pizza place and get a large pizza of my choice and have a great meal for another $12 to $15, which still leaves me with over a $165 to buy another pair of heels and an outfit to go with them (Had I been so inclined). I don’t think I’ve heard of Sophia Webster. If I saw those shoes I would assume the woman wearing them was named Sophia. I’d figure the shoes came with all different names on them like the Coke bottles do and you just buy the pair with your name on it. Anyway they are silly and I don’t like Coke (I know, it’s weird) so I don’t like the shoes.